1. The per treatment Kt/V for short daily HD (with the NxStage system) is about 0.45. How many treatments per week are necessary to achieve an equivalent clearance to thrice weekly in-center hemodialysis? 2. ACE inhibitors predispose patients to anaphylactic reaction when exposed to which of the following dialyzers? Post prepared by Rimda Wanchoo, MD, Assistant Prof of Medicine, Hofstra NSLIJ School of Medicine. 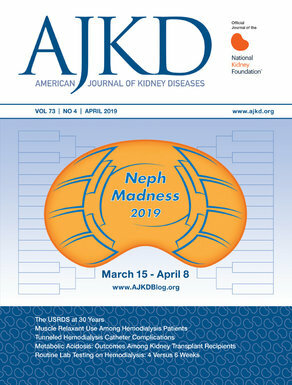 To view the article full-text or PDF (freely available), please visit AJKD.org.